Omm Ali.... I think maybe I should change the name of this recipe to "Omm..my God, Janet just make another bread pudding!". As any regular reader of this blog would already know, I have a bit of an obsession with bread puddings. But I think I may have finally found the cure, it is the bread pudding to end ALL bread puddings. The king of bread pudding. No, the Pharoah of bread pudding. I'm not sure I will ever post another Bread Pudding, because I just don't think this one can be topped. Omm Ali is an Egyptian Bread Pudding, I saw this recipe in a Mediterranean Cookbook and I knew it was going to be good. I'd never heard of this dish before, but it was absolutely fabulous. I can never make a recipe without messing with it a little, the only thing I changed in this one was to add 1/4 cup of sugar. The original recipe didn't call for any sugar, and I thought it could use some. I was also supposed to sprinkle cinnamon over the top of the dessert for decoration, but I was in such a frenzy to take my pictures and sink my teeth into this that I forgot. This dessert was really so wonderful, I decided to send it over to Meeta for her birthday. This month Meeta, from What's for Lunch Honey? is hosting the Monthly Mingle and she tied the theme in with her birthday. adapted from "Mediterranean Food of the Sun" by Jacqueline Clark and Joanna Farrow. 1. Preheat oven to 325°F. 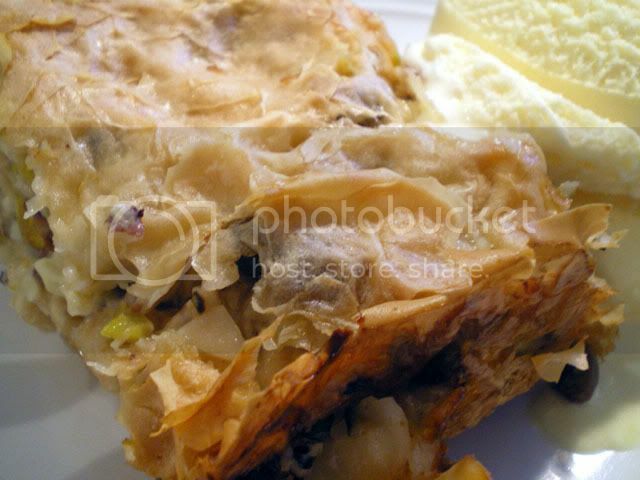 Stack the sheets of filo on two baking sheets and bake for 15-20 minutes until golden and crisp. 2. Mix the three types of nuts and raising together. 3. Crumble the filo pastry roughly and spread in layers with the nut mixture in a shallow casserole dish (I used a 2.8 litre oval dish and make 4 layers of crumbled filo and three layers of nuts). 4. Heat milk and cream in a saucepan until very hot, but not boiling. Slowly add the beaten egg and the rose water. Cook over low heat until the mixture begins to thicken. (it didn't really thicken much for me, but it didn't seem to matter) Stir in 1.4 cup sugar. 5. Pour the custard mixture over the crumbled pastry and nuts. Bake for 20 minutes at 400°F until golden. Serve with whipped cream or ice cream.